Your bedroom; the ultimate personal haven. It should be as unique as you are, providing you more than just a place to sleep, but also a space where you can relax and unwind. At Oak Furniture Land it's easy to create a look that completely matches your personality. With over twenty ranges of bedroom furniture to choose from, you're guaranteed to find something that suits your style, from laidback chic to lavish hotel styling. Where's the best place to start when designing a bedroom? Making a great bedroom design starts with great planning. There are so many possibilities when planning a layout for your bedroom, and your furniture placement creates the bones of a good design. Consider the size of your room, and how you'd like it to function, and this will help guide your choices. Start with the numbers; measure your room, noting where you visualise larger pieces fitting. All our products have the dimensions listed, so it's a breeze seeing if they will fit in your space. Worried that your bedroom is too small? Look for pieces that perform double duty - like our wardrobes, which can store all manner of belongings. Have an unconventionally shaped room? Don't worry, use your L-shaped space to create different zones; you could have a sleep section, a dressing room area, maybe even a work space all created with different furniture placement, or soft furnishings. In fact, every room has the potential to become your dream bedroom, and we've certainly got the furniture that you're going to need to make sure you get the most out of what you have. Now that you have a plan for how you'd like the space to flow, check out our handy guide on selecting the perfect pieces to bring the design to life. 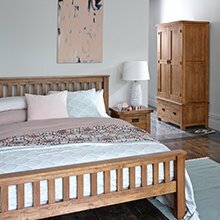 Why should I choose hardwood furniture for my bedroom? Hardwood furniture offers many advantages in bedroom furnishing. 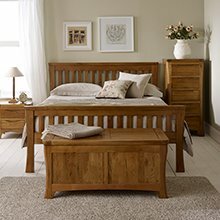 At Oak Furniture Land, all of our bedroom products are exclusively designed, and made by skilled craftsmen to ensure that they remain beautiful and durable over time. We never skimp on materials or construction; all drawers are made with dovetail joints, and solid wood bases, backs, and runners for longevity. 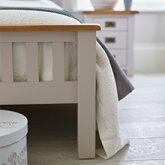 In our bed frames, we use real hardwood for the slats, which is carefully kiln dried for support. Contrary to metal frames, our beds require little maintenance and are very practical. Plus, we want to help you relax into your new bedroom, which is why we offer free or express delivery to the room of your choice. Where should I start when designing my bedroom? In the bedroom, the real star is, of course, the bed. It takes up the majority of the floor space, and it's where you look to collapse into at the end of the day. It's really the first thing you see when you walk into your room, and as such, it's the ideal piece of furniture to centre your design around. When it comes to beds, we really believe bigger is better. The more space you have to sleep in, the better your rest, and a bigger bed is a better canvas for creating your own cosy design with linens, pillows and more. Measure to test the maximum bed frame size that works with the dimensions of your space. We have more than twenty different ranges of bed frames available across four different sizes (single, double, king-size and super king-size) and also make best-in-class mattresses too. From solid foam to encapsulated pocket spring, all of our mattresses are made to an astounding quality specification. We've undergone extensive testing to make sure our mattresses and beds work well together, knowing that it helps pave the path towards your best sleep. How do I decorate around my bed? Love a matching set? Choose pieces from the same range for a bit of hotel chic. Creating a quirky space? Mix and match pieces within our ranges for an eclectic, yet coordinated feel. Want to start afresh? A clean slate is an affordable possibility with our fantastic finance options. Who's the bedroom for? You can adjust your style, storage needs, and bed size based on who will be sleeping in this space. Bedside tables are great for storing everything from your charging phone to a secret stash of midnight snacks. If storage is your goal, units with drawers or cupboards are great for hiding all sorts of knick knacks away, or a simple shelved unit provides a minimal look. We've even seen our customers use dressing table stools to create simple scandi style! And speaking of dressing tables, these can create a space in your bedroom dedicated to true self care. Pamper yourself with a mirror or stool set to complete it, and make a peaceful place to get ready for the day. There are lots of storage solutions to help you create a truly cosy room. Wardrobes add classic style while giving you great space to hang and store your clothes and linens. Our double and triple styles can fit your room. 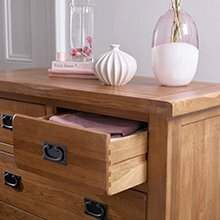 Chests of drawers in all sizes don't just tidy your things, they also provide a great display area. Also, blanket boxes are a great addition to the bedroom; place one at the foot of your bed for a stylish way to complete your space. How do I accessorise my space? Now that you've chosen your key hardwood furniture pieces to frame the room, how do you furnish it to meet its full snuggly potential? The key is in the little details you use to bring the room to life. Soft furnishings, like squishy pillows and sumptuous throws help to create that peaceful and relaxing vibe you want in a bedroom. Houseplants - if you can keep them alive - also have a calming influence, and help to purify the air. A lavender pillow spray is a great way to accessorise your bedside table, as the scent helps to lull you into a slumber. 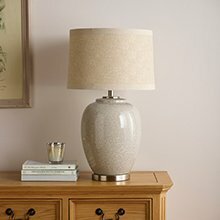 Lamps are a brilliant way to brighten up your bedside table - quite literally. A warm glow from a lamp creates a more intimate feel than overhead lighting in a bedroom and is a great way to step up your decor. Floor lamps can help illuminate awkward corners of your bedroom to make use of every bit of space. A gorgeous finishing touch to your bedroom, mirrors are a great way to give the illusion of extra space and light. Choose from vertical mirrors that can be used as a dressing mirror or to light up an alcove or horizontal and table mirrors. All our table top swivel frames are designed to match our dressing tables, but can be used anywhere you need to reflect extra light around a room. Don't forget to keep an eye on the time. A stylish clock can be used to liven up a bare wall, add interest to a chimney breast, or to simply keep track of your busy life. Choose from traditional or avant-garde, understated or maximalist. Whatever your preference may be, we have the ideal clock for you. Don't worry if you need a bit more inspiration. Check out our pinterest, blog or instagram, or your favourite interior magazines are packed with ideas for creating your perfect style. How can I maximise my bedroom space? If you have a platform bed, find some vintage suitcases that will slip underneath to add additional storage for a more decorative approach to plain storage boxes. Save space by hanging up shelves that reach up to the height of the ceiling. Utilising the wall space this way will elongate the height of the room and act as added storage. Using light-framed mirrors help creating an illusion of more space. A tall mirror will create the impression of higher ceilings whilst a long wide mirror will lengthen the space. Consider splitting the room into two sections, one acting as the bedroom and the other as a workspace or dressing room. If you've chosen a dressing area for the other nook of your bedroom, you could create a walk-in wardrobe area. A taller but thinner chest of drawers will allow for more floor space and accompanied by a wide mirror will make the space feel larger. Two rooms in one means you have the perfect excuse to finally use a divider in your bedroom! Perhaps a classic folding screen? Or lightweight fabric curtains to separate the sleeping area? If you've got space, you may want to construct a bookshelf divider for storage space too. Make its originality stand out by painting the slope of an attic room a different colour. We suggest placing the bed close to the sloped ceiling. It is the perfect area for creating a cosy nook and with some fairy lights, scented candles and bundles of cushions, you'll create an intimate space, perfect for a bit of peace and quiet. If you only have the one slanted ceiling, adding low seating will help the room feel like a secret, getaway area. Is the space under the sloped ceiling too low to be useful? Add a long, low unit in the shortest area for an added storage and display area. Use a rule of thirds, with the furniture placed at the bottom third of the frame to create a focal point within the large room. You can also go big and bold with statement lighting. A grand crystal chandelier will create a luxurious and chic aesthetic or for a more rustic feel, grouping and hanging lightbulbs together works well. Use the extra wall space to your advantage! Oversize accessories like our popular Tosca Wall Clock help play on the scale of the room. If you've got low ceilings in your cottage or new build home, create the illusion of height by diverting the attention to key pieces in the room, like an unusually styled chair. Painting a feature wall will immediately distract the eyes to focus on the colour of the wall rather than the ceilings. If you're feeling particularly daring, you may want to try painting vertical stripes of a contrasting darker or lighter colour. What are the advantages of a hardwood bed? Wood bed frames, contrary to metal, require little maintenance and are very practical. They can be used to create a timeless look and can easily last a lifetime. All our beds are made to the highest quality hardwoods by skilled craftsmen with each piece being carefully made ensuring durable and beautiful frames, headboards and footboards. We never skimp on materials at Oak Furniture Land, which means that even the slats are made from one hundred percent solid wood, promoting optimal air circulation. Does Oak Furniture Land sell mattresses? Yes, we do. In fact, we have a large range of mattresses to suit any taste or budget. From solid foam to encapsulated box spring, all of our mattresses are made to our higher quality specification. Knowing that the path towards the best sleep you can get is more easily achieved by combining a great mattress with a superior bed base, we test our products thoroughly to make sure they work well together. There's a reason why they say to ‘measure twice and cut once’, good planning is the basis of good design. You spend a third of your life asleep, so invest in bedroom furnishing that will stand the test of time. It's the most dominant piece in your room and can help guide your design. And accessorise accordingly. 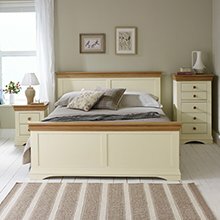 We have more than 20 ranges to help create any bedroom style. Clever furniture selection helps to make the most of difficult rooms. Expert advice and a high quality selection of bedroom furniture is easy to find. 7. Sleep easy in the comfort of your new bedroom.